I've been playing the StarCraft 2 beta more than anything else recently. The game is slowly making more sense in my mind. There are so many levels of complexity that are hard to grasp, but I love the challenge of trying. I played the original StarCraft when it came out, but that doesn't necessarily put me at an advantage. It was released in 1998 which means I was 11 years old at the time. I didn't have a grasp of complex strategies. I was never very good at StarCraft, but I thought it was fun and I played it with friends. This time around I'm trying to learn strategies. I'm watching replays. I'm talking to people who understand the game. I played a bunch of games with my brother sitting over my shoulder verbally managing me until I got better. All of my efforts are helping. As long as I play StarCraft 2 I'll try to post my insights on this blog. Consider this the start of my StarCraft 2 Newbie Guide: By a Newbie, for a Newbie! I hope it helps guide your way. I'd like to start with two good pieces of advice that have made a world of difference in my first week of playing. Some people in the platinum league can play random competitively, but most people can't. I decided to stop playing with all three races and concentrate on Protoss. I'm good at setting up my economy and thinking big picture, but I have trouble controlling a large group of diverse units. 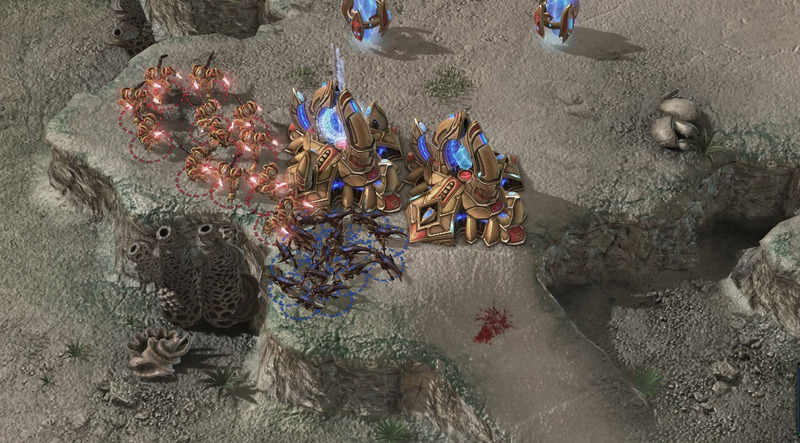 Protoss tend to make less units total, but each unit is more powerful. This suits my strength and weakness. I was completely overwhelmed playing Zerg and dealing with their massive unit count. Picking Protoss over Terran is more of a personal preference for the way the Protoss tech tree works. I like not worrying about upgrading the Terran command center or adding on to their buildings. By all means experiment with the race choices, but in the end make sure you pick one race and stick with it. In StarCraft 2 each starting base is elevated and has a small ramp leading down to the rest of the map. Since early units for every race are ground units you are able to effectively defend your base at the chokepoint created by your ramp. You can dissipate their strength of numbers if someone rushes you with more units than you have. It's important to be able to defend your ramp, especially if you aren't playing aggressively. For Protoss, build a pylon near your ramp and then two gateways to produce units and position them to block all but one lane into the base. The Protoss strategy is the most straight forward and it has served me well ever since I started using the technique. With a Terran build you are able to block the ramp completely with a barracks and one or two supply depots. You can also make Terran ramp blocks with a bunker in the mix. Terran have the ability to sink and raise their supply depots whenever they want to, which is a huge advantage because they can completely block their ramp and hide their units behind their structures while defending because marines have ranged attacks. Then they can lower their supply depots whenever they need to move units out of their base. I've found it's much harder to plug a ramp with Zerg. It's more important to simply defend your ramp with units instead of trying to block it off with structures when playing as Zerg. Set your rally point for aggressive units to the top of the ramp so that they accumulate there while defending the entrance to your base. As long as you can keep your opponent from scouting your base you will have an advantage in the game. I'm no star player, but I hope to get better and post my findings here. I know I won't be helping the pros at all, but maybe my fellow newbies can pick up some tips from this on-going guide. I still can't believe you won that Platinum game. Good work. Nice choke blocking pic btw. That is a screenshot from the platinum game that I won. I held him at the choke until I upgraded my zealots with charge. Then I preceded to own his zerglings and push all the way back to his base. Great and helpful guides. Much more so than the in-game 'move your unit here' tutorials. I've found that to be true also. Only having to learn one play style means you can get better at it faster.